This year, I’m a Mo Willems Ambassador (fancy!) and this post is compensated as part of that program. Obviously, before it was official position, I was already a giant fan of Mo Willems’ books because how could I not be? For the first two and a half years of Ella’s life, we spent SO much time together. I cannot tell you how many games of Memory and Bingo we played (but it was definitely hundreds). We took daily walks to the dog park or to swing on the swings, she helped me in the kitchen, and we read so many books together it’s a wonder I’m not blind. Now, though, with three little children and more activities and responsibilities on my plate, it’s harder to fit in time with each of my girls individually. While all my girls seem to enjoy one-on-one time with me, I’ve noticed that Ani especially seems to crave that undivided time with me. A few weeks ago, I was reading some article about balancing working and family, and this woman said that she’d recognized that her children could be really filled up with just 15 minutes of her undivided attention. Instead of feeling like she needed to set aside hours and hours (which she didn’t really have the ability to do), she would put away her phone and computer and play with blocks or dress-up or sing songs for fifteen minutes. This was a lightbulb moment for me. I don’t need to set up these elaborate dates with my girls to have individual time with them – I can just set aside small chunks of time much more often to focus on just one of them. Now, if Star wakes up from her nap while the other girls are in quiet time or playing happily together or with Bart, I’ll go in to her room, close the door and we’ll snuggle on the bed or read a few board books or do “This Little Piggy” twenty times. Or on the weekend, if we have some errands to run, I’ll have Bart take the two little girls, and Ella and I will go to the post office or the grocery store or Target on our own. It’s so interesting to see how chatty and different each of the girls are when they are on their own. Ani is kind of a homebody (unless it’s the pet store, she almost never wants to go anywhere, even if once we get there, she loves it), so most of our 15 minute dates are at home. I’ll put Star down for her nap and Ella will start quiet time, and then I’ll tell Ani it’s time for her special date. Usually, her requests are to read a book together and then play a game. In 15 minutes, we can easily read a book and play a game together, and that time has been enormously valuable and has made a huge difference in her behavior as she works her way through being a three-year-old (which is easy on no one). 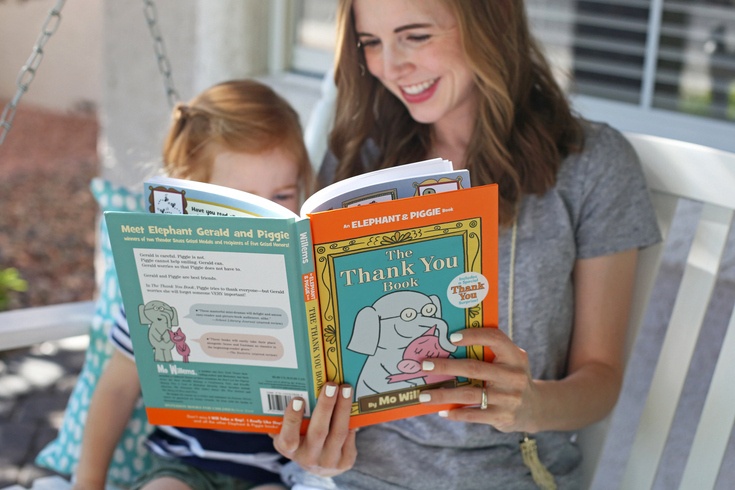 For the past few weeks, her favorite book has been The Thank You Book, which is the last of the Gerald and Piggie series (yes, my heart is breaking too). Ani has always loved this series and we own quite a few of the titles, plus whenever we go to the library, she always grabs three or four more. I love the chance to sit next to her, read without Ella’s constant interruptions, and let her find the Pigeon on the end papers. Afterward, we’ll play a quick game of Sleeping Queens, and then she happily goes down for quiet time without the fuss that usually accompanies it. Sometimes, all she wants to do is read The Thank You Book three times in a row (something that Ella is never interested in because she’s kind of past the stage of reading a book over and over and over again in a row), and I love that this gives me the chance to fulfill her request. These 15 minute dates have been a game-changer in my relationships with all three of my girls. It’s really helped me to recognize a moment when I could spend time with just one of them, and identify it as a 15 minute date. It helps set the stage as a time for us to focus on each other, and signals to me to put my phone away and not be distracted by other things. And I don’t feel like it just benefits them. I also feel like it gives me the opportunity to be more present, learn more about the things they are thinking about or interested in, and helps me be more patient and loving when things are difficult. We love Elephant & Piggie! And just all of Mo's books!! And I'm definitely stealing this 15-minute date idea. I spend lots of time with the little one, but not as much alone time with her brother. Genius. I'm realizing with a baby coming I'm going to have to work extra hard to get one-on-one time with my girls and I love this idea. And, we are kind of new fans of Elephant and Piggie (living under a rock apparently.) But we're having so much fun giggling our way through them! I started doing that last summer. It was a huge hit. Knowing it was only 15 minutes helped with my anxiety about having all these looming chores still pending. With the school year I've only been doing it with the littles still at home, but look forward to restarting it with everyone. We enjoyed walks around the block, looking up new craft ideas on Pinterest together, making a movie using my phone, and I was always surprised with the creativity my kids showed when coming up with something for 15 min. This is super smart. I always feel so wary of jumping into play time with my kids because they expect me to commit the rest of my day and I obviously can't do that. But 15 minutes? I can do 15 minutes. This is a life changer. Brilliant. Shonda Rhimes mentioned something like this too and ever since then I've been trying to so hard to implement something similar with my daughter. It's made me so much more aware of how much I have poorly "multi-tasked" while spending time with her! We love Mo Willems and the Elephant and Piggie books! I'm sad this is the last in the series. You might already know this, but The Thank You Book is technically not the last in the series. The illustrator is going to continue on without Mo Willems. The next book comes out in July. Not sure what I think about that, but at least it's something. WE've only read two of those books from the library, but they were a big hit. I really liked how you said that you get just as much out of those fifteen minutes as she does! We love these books in our house too. I love the idea of quick 15 minute dates. I do something similar with my 4 1/2 year old while the 2 year old is napping…usually a quick game, some stories or a craft or colouring together. She loves it and soaks up that one on one time and I can definitely see how it benefits me too. 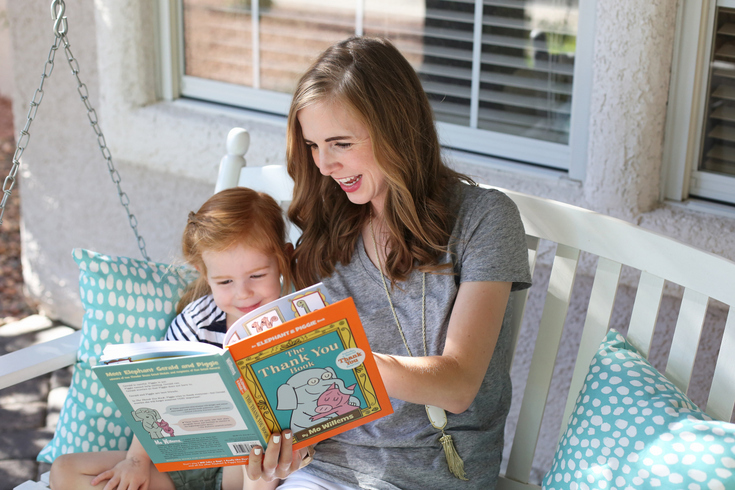 Seems like I catch up on your blog every three months – and I am so glad I do!! Mo Willems is a favorite around here! That's so great you get to be an ambassador. Our favorite is "We Are in a Book" I gift it to their teachers every year and say "you're welcome" when they finally get to the last page that says "read it again" because you know, that 20 kids are begging for it again!! And the 15 minute date idea is brilliant.